CosPro Agency’s Makeup Artists executed a recent demonstration at 50 stores featuring Fiberwig Mascara. 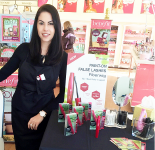 The Makeup Artists performed almost 650 complimentary demonstrations to shoppers—and handed out over 1,700 product brochures to educate customers on the mascara. Women were eager to try the Fiberwig product and receive tips from the experts. 84% had not heard of Fiberwig before, making the event great for product awareness. 79% of customers said they would switch brands! The 4-hour event was a success, resulting in over 350 products sold! The Makeup Artists were also able to train almost 200 store associates on Fiberwig Mascara to help increase future sales. © 2019 CosPro Agency. All rights reserved. All other trademarks are the property of their respective owners.